You, as organisation, are best informed on your products, services and everything that happens in your branch. 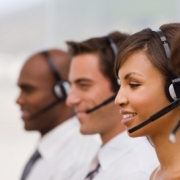 Call-IT, on the contrary, has a wide experience with managing customer contact, our core activity. Acombination of both aspects leads to success. Do you want to call attention to your products in a professional way within a large target group? Do you want to be sure that your customers are satisfied with you and your services or products? Do you want your sales department to have more appointments or do you want to regain your ex-customers? Do you have only the company and function names of your prospects in your CRM database, but no names and phone numbers of contacts? Our employees are specially selected and constantly trained and coached. Further more they disposeof a "state of (after all) the art" switchboard which can be presetvery flexibly and contributes to an optimal transaction of these contacts.